Mbah Maridjan and the volcano. 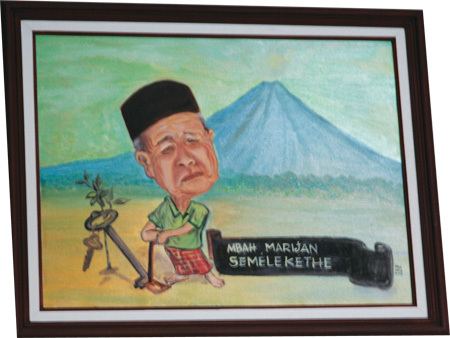 Mbah Maridjan, gatekeeper and key-holder of Mount Merapi, came to prominence in May 2006 as news reports showed a smoking Merapi and residents of the volcano’s slopes were warned to evacuate. His neighbours stayed with him, trusting in his belief that the volcano would not in fact erupt, whatever outsiders might say about the dangers. Mbah Maridjan is a deeply respected figure in the community and is believed to possess a special wisdom in spiritual matters. Formally, Mbah Maridjan is Muslim. As we enter his yard at the foothills of Merapi, we see a Javanese-style mosque that he has constructed at one side, next to a path that leads towards the mountain. However, he does hold traditional Javanese beliefs (kejawen) and practises spiritual ceremonies such as nglakoni and tirakat. We haven’t made an appointment with Mbah Maridjan, but he seems entirely unsurprised by our arrival and beckons us into his house. The role of the key-holder is a spiritual one: he is responsible for performing rituals and making offerings to the mountain, in order to ensure the safety and peaceful existence of all of Yogyakarta. Mount Merapi is a sacred site which is of great importance in the ‘magical axis’ of Yogyakarta, along with the South Sea and the Keraton. The spiritual rulers of Merapi have traditionally acted as protectors of the kingdom of Mataram, and are now protectors of Yogyakarta. This relationship is maintained through the jurukunci, the Sultan’s representative, stationed on the southern slope of the mountain. When his father passed away in 1982, the Sultan conferred the title of jurukunci on Maridjan. Maridjan accepts his role and the accompanying public profile with grace. The fame is not accompanied by any fortune: as gatekeeper and key-holder, Mbah Maridjan earns Rp.5,600 per month (approx. 60 US cents). With his thirteen assistants, he prays and performs daily ceremonies on behalf of the people of the region. He remains humble and dedicated. (First published in Kabar Indonesia, May 2007).